It's hard to get excited about a new camera that principally only adds wi-fi and NFC connectivity to its predecessor. 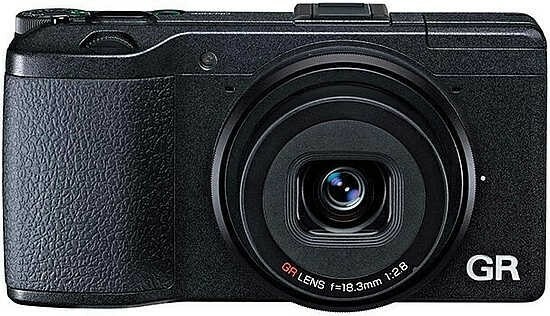 The new Ricoh GR II certainly takes the title of "Smallest Upgrade Ever", with just a handful of other minor new features to justify the full RRP of £599.99 / $799. Still, the original Ricoh GR was an excellent camera in its own right, so while we wouldn't suggest (at all) that owners of that camera should rush out to upgrade, the Ricoh GR II remains an attractive proposition if you're looking for a responsive, full-featured, understated and pocketable camera that delivers outstanding still images. The Ricoh GR II (V) features a large APS-C image sensor that delivers great results. There's almost no noise from the base sensitivity of ISO 100 all the way up to 3200, with the higher settings of 6400, 12,800 and even to a lesser extent 25,600 all perfectly usable for smaller prints - very impressive for any 1.5x sensor, never mind one housed in a humble compact camera. The tack-sharp 28mm lens and the on-trend absence of an optical low-pass filter both improve the image quality further, with the option of the ubiquitous Adobe DNG RAW format if you want to take control, complete with in-camera RAW processing. The Ricoh GR II also excels in the speed department, with snappy autofocusing, fast power-on, shutter-lag and shot-to-shot times, and even 4fps burst mode for both unlimited JPEGs and an increased number of RAW files. The proven Snap AF mode makes the GR perfect for street-shooters, with the 35mm/47mm crop modes and the 21mm conversion lens very handy for those who desire a closer or wider view than the 28mm lens provides. The Ricoh GR II excels in the customisability department, with three function buttons, three My shooting modes and other customisable controls making this a camera that you truly can setup to suit your way of working, although it does take a while to work out what the best combinations are.